The leading city in one of the nation’s most populous slaveholding states, St. Louis was a strategic prize like no other. Not only the largest settlement beyond the Appalachians, it was also the country’s second-largest port, commanding the Mississippi River as well as the Missouri, which was then navigable as far upstream as what is now the state of Montana. It was the eastern gateway to the overland trails to California. Last but far from least, the city was home to the St. Louis Arsenal, the biggest cache of federal arms in the slave states, a central munitions depot for Army posts between New Orleans and the Rockies. Whoever held St. Louis held the key to the Mississippi Valley and perhaps even to the whole American West. Wenn wir’s auch nur sterbend gewannen! For hangmen’s blood and for tyrants! These men were part of a wave of German and other Central European immigrants that had poured into St. Louis over the previous couple of decades. By 1861, a visitor to many parts of the city might indeed have thought he was somewhere east of Aachen. “Here we hear the German tongue, or rather the German dialect, everywhere,” one Landsmann enthused. Politically, too, the newcomers were a class apart. Many had fled the aftermath of the failed liberal revolutions that had swept across Europe in 1848. Among those whose exile brought them to Missouri was Franz Sigel, the daring military commander of insurgent forces in the Baden uprising—who, in his new homeland, became a teacher of German and a school superintendent. There was Isidor Bush, a Prague-born Jew and publisher of revolutionary tracts in Vienna, who settled down in St. Louis as a respected wine merchant, railroad executive, and city councilman—as well as, somewhat more discreetly, a leader of the local abolitionists. Most prominent among all the Achtundvierziger—the “Forty-Eighters,” as they styled themselves—was a colorful Austrian émigré named Heinrich Börnstein, who had been a soldier in the Imperial army, an actor, a director, and most notably, an editor. During a sojourn in Paris, he launched a weekly journal called Vorwärts!, which published antireligious screeds, poetry by Heinrich Heine, and some of the first “scientific socialist” writings of Karl Marx and Friedrich Engels. I suppose that the burial of this fascinating and important piece of U.S. history is due to some combination of uneasiness about popular rebellion (even if this was an anti-rebellion rebellion, so to speak) and the waves of anti-German cultural erasure associated with the two world wars. Against this background, it's relevant to review some of our past posts about German cultural and linguistic assimilation in America. Thus in 1751, Benjamin Franklin asked "Why should Pennsylvania … become a Colony of aliens, who will shortly be so numerous as to Germanize us, instead of our Anglifying them, and will never adopt our language or customs, any more than they can acquire our complexion?" (More on this here and here.) A Nebraska state law making it a crime to teach German to children was overturned by the U.S. Supreme Court in 1923. And in 2004, the NYT noted the passing of a woman whose ancestors had immigrated from East Friesland to rural Illinois in 1841, and who at the age of 100 spoke English only with a thick German accent, although she was born more than 60 years after her great-grandparents arrived the U.S. The cited marching song was apparently written by Theodor Körner around 1813 to celebrate the Lützowsches Freikorps, "a voluntary force of the Prussian army" which fought against Napoleon. You can hear a bunch of sung versions on YouTube. How (and I suppose in truth whether) it ended up in St. Louis in 1861 is not entirely clear to me, but no doubt some readers can explain it to us. … Ich befand mich in der schönen, breiten Common Street, in welcher mir das Firmenschild einer deutschen Bierstube in die Augen fiel. Ein Schluck Pilsener in dieser Hitze konnte nichts schaden. I found myself on the nice, wide Common Street, where the sign of a German tavern caught my eye. A sip of a nice Pilsener in this heat wouldn't hurt. Pilsen/Plzeň being a Czech city, the Slovak translation I first read this in made a point of noting that back then, Germans considered the Czech lands a part of Germany. In contrast, history textbooks do not neglect the Hessian soldiers of the Revolutionary War — perhaps because they were hired by the British? Anyway, the fact is consistent with your analysis. Pilsener beer was invented in 1842 by a Bavarian brewmaster brought in by the city council of Pilsen. He brought with him distinctly Bavarian techniques of bottom fermentation and lagering. Also, the Pilsener style quickly became popular throughout Germany in the latter half of the 19thC. So even if Germans hadn't been considered Pilsen part of Germany, a German after the Civil War may well have had a taste for Pilsner. Baltimore, Cincinnati, and St. Louis were called the "German triangle"; Baltimore, at least (and I think the other two as well), had an parallel public school system, where classes were taught entirely in German, right down to World War I. It really is amazing to me how much this culture seems to have completely vanished so swiftly. Have there been any studies on how bilingual German-speaking communities were in the second and third generations? Also of interest is the inclusion in the piece you quote of a Czech Jew among the "Germans," which makes sense given that German was almost certainly his native language, and this is a linguistic community. My wife's grandmother was born in 1912 with the very Jewish last name "Kohn," but the family changed it to "King" during the anti-German hysteria of WWI. The Holocaust makes the conflation of Jews and Germans seem bizarre now, but the two were strongly identified before that. very true, all of that. But in Slovak (and Czech, for that matter), the adjective "plzeňské" is primarily (and to laymen, not to mention kids 12-15, almost exclusively) a designation of origin, hence the need for clarification. The importance of the German-heritage Missourians preserving St. Louis for the Union is well-presented in the more comprehensive histories of the Civil War. I'd like to add a little extra about the Nebraska law mentioned in this article. It banned teaching not just German, but any foreign language, to children who had not yet attained the eighth grade. The ban applied both to public and private schools. (By interpretation of the Nebraska Supreme Court, however, it only applied to "living" languages and not Latin, ancient Greek, or Hebrew.) The law wasn't specific to Germans, but the xenophobia which motivated it probably was. The bill was enacted soon after World War I in a state with a large and self-contained German immigrant population. The Nebraska statute was overturned in Meyer v. Nebraska. Meyer is seen by many as the beginning of the modern use of "substantive due process" (a phrase it never actually employed) to strike down laws offending personal liberty. It is thus an antecedent for the cases guarantying privacy and reproductive rights, including Griswold v. Connecticut and Roe v. Wade. Meyer has also been said to mean that parents have a liberty interest under the 14th Amendment in raising their children without undue interference by the state. I think the intent of the Court may have been misunderstood, but that boat has sailed. The case is a bit of a mystery because of its author, James McReynolds, who is said to have been perhaps the most dreadful and bigoted person ever to serve on the Supreme Court. An example: One year he refused to pose for the official photographic portrait because tradition would have required him stand next to Justice Brandeis, a Jew. (He also hated blacks, women, and many other groups.) McReynolds, a true believer in the Constitution's protection of economic liberty, was one of the (in)famous "Four Horsemen," who did great damage to FDR's early New Deal legislation. I suspect that McReynolds would be horrified where the path he founded in Meyer has led. http://en.wikipedia.org/wiki/Forty-Eighters#Famous_German_Forty-Eighters_in_the_US is a good way into this topic. Perhaps the most important of that generation was Carl Schurz: journalist, Civil War general, Sec'y of the Interior and senator. How would Koerner's song from 1813 make it into St. Louis emigrant culture? Political repression in Germany had much to do with that. Songs, poems and other outpourings of Romantic sentiment stood in for explicit political speech and writing. The dream of German unification had become almost universal via the Befreiungskrieg (war of liberation) vs. Napoleon, and remained so until it became a reality. Political organizations were often suppressed, so the sports and singing clubs, both of which became quintessentially German phenomena in those years, provided outlets for quasi-political expression. Already present in the US before '48, such clubs became centers of German-American culture–and a few still exist. @jfruh: the "German/Jewish" conflation was so pervasive that "German" was even used as a code word by antisemites. @Tom: a similar law in Iowa enacted after the war forced the parish school that my mother (b. 1914) went to to switch from instruction in German to English after her first grade in German. She forgot all her German and never used it again; so I grew up not knowing German, dammit. There's probably no need to mention the Amish children growing up in America as native speakers of Plautdietsch, not all of whom speak English very well. The Amana Colonies in Iowa is another place where you will still encounter native-born Americans who speak English with a German accent. German Kultur was alive and thriving when I lived in St. Clair County,Illinois,just over the river from St. Louis. There were dozens of small towns that had been settled in the 1840s en masse from parishes in Germany. There were agencies that handled the entire process. Mascoutah, near where I lived, elected a state representative in the 1920s who didn't speak English and in the late 50s people were still fuming about the problems that caused. Because they were settled as communities already organized with an organic church, they retained German bilingual parochial schools well into the 1950s. There were some great little German restaurants, too. We lived there after four years stationed (USAF) in Germany and felt right at home. The small city I live in now in central Maryland was settled by Pennsylvania Germans in the 1740s and still has a German substrate in the local vocabulary, if you listen carefully. IIRC, at the beginning of Karl May's 'Winnetou I' book (which takes place either during or some time after the Civil War), the protagonist (a German) spends time in St. Louis where he finds employment as a tutor in a German family and meets several other compatriots. Karl May influenced young Germans heavily at the turn of the 20th century. As old famous writer he gave once a public lecture in Wien that young Hitler attended. Hitler admired May and vindicated his criminal excesses. I even read an interesting observation that Mein Kampf so to speak emulates the style of May's novels. A great number of German immigrants increased the city's population during the 1840s and continued to migrate to the area during the following decades. Milwaukee has been called the "Deutsches Athen" (German Athens), and into the twentieth century had more German speakers and German-language newspapers than it had English speakers and English-language newspapers. The German heritage and influence in the Milwaukee area is widespread. As of 2010, the Greater Milwaukee phone book includes more than 40 pages of Schmitts or Schmidts, far more than the pages of Smiths. During the middle and late 19th century, Wisconsin and the Milwaukee area became the final destination of many German immigrants fleeing the Revolution of 1848 in the various German states and in Austria. In Wisconsin they found the inexpensive land and the freedoms they sought. @VMartin: "Mein Kampf so to speak emulates the style of May's novels" is one of those statements that could mean just about anything, even without the "so to speak." Besides, MK was heavily edited by Bernhard Stempfle, so we don't even know whose style was allegedly emulating May's. Did Hitler attend that lecture? Only an anonymous memoir says he did, and Hitler–who did mention May often–never talked about such an event. And he most likely would have, given that May died only 10 days afterward. What "vindicated his criminal excesses" might mean, I can't begin to guess. In the event, Hitler was one of millions and millions of German and other readers who were (and still are) impressed by May's writings. My father, my grandfathers, Karl Zuckmayer, Albert Einstein–they all loved those books, and Einstein read them in adulthood too. A strange and anecdotoid book by Charles Berlitz, "Native Tongues", has a paragraph on p. 43 (Perigee 1984 printing) about how German almost became the official language of the US of A during the revolution. One vote majority for English. This is debunked by snopes.com as a "one-vote canard"; neither has any documentation whatsoever. At that time there was lots of urbanity, little in the way of urban growth, except for myths, apparently. What do you erudite people say? @a George: http://en.wikipedia.org/wiki/Languages_of_the_United_States#German sums it up. It wasn't during the revolution; it wasn't about an official language; and the one-vote majority was procedural–the bill to have government documents also published in German failed to reach the floor by one vote. In a preface to The Eighteenth Brumaire of Louis Napoleon, Karl Marx talked about his "good friend Joseph Weydemeyer" and included a footnote calling him "[m]ilitary commandant of the St. Louis district during the American Civil War." I puzzled about this for years, never having heard the story elsewhere and unable to find any reference to Weydemeyer in pre-internet days. According to the Wikipedia article on Weydemeyer, he was a former Prussian officer turned socialist who published various German-language labor publications in the United States. He helped to steer the German immigrant population into the Republican party and the anti-slavery cause. It's not clear to me that he was the commandant, but he was a Lieutenant Colonel and he commanded a Union regiment in Missouri. 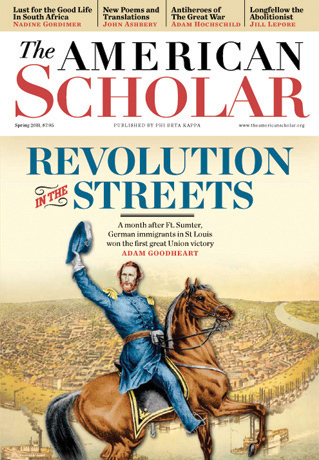 It's fascinating to read about the St. Louis context cited in the Goodheart's article. Franz Sigel, mentioned in the excerpt, became a Union general who, despite a string of losses, Lincoln kept around because of the political pressure of the Saint Louis Germans, including Shurz. If you look at Sigel's command, especially in Missouri, almost all his subordinate officers had been Saint Louis Germans. Many of the "48ers" including Sigel belonged to paramilitary companies in Saint Louis which drilled and trained despite not being part of the organized militia, so they were better equipped and ready to fight than most urban Unionists. Don't know where to begin. Been gone from LL a couple days and find paean on German-American things, + Karl May, of all things. My good friend George Minty, great mathematician (the Klee–Minty cube is the least of his inventions), informed me that KM uses Elizabethan swear words in Winnetou, e.g., 'Zounds (His wounds). Being of German-Danish-English provable, and probably Sephardic & Ashkenazi ancestry, my Hamburg aunts Oohed and Aahed when 1st confronted with my curly locks (shape of nose, and slightly olive skin) in 1937 – putting them all in mortal danger. Tried to research ancestry: Senhor Añez left Portugal in 1492 for England, took name of Mr. Ames, sons went to Holland, Nederlandized name to Amsinck(? ), descendants went to Hamburg when the City hired Dutch experts to build giant ramparts for the new city wall that protected the town from wars until razed by Napoleon after 1806. Being an ethnic mix good for being flexible, not popular with anybody else of the full-bloods. Did Hitler attend that lecture? Only an anonymous memoir says he did, and Hitler–who did mention May often–never talked about such an event. I remember reading that Hitler was excited after the public lecture Karl May gave in Vienna. I suppose Austrian historician Brigitte Hamman wrote about it. Btw. how he could have missed a lecture named "Empor ins Reich des Edelmenschen" ? The peculiar thing is that Karl May is known solely in Central Europe. I wonder whether anyone from France or USA ever heard about him. On the other hand every shool-boy in Germany or former Czecho-Slovakia must have read something written by him – at least some 30 years ago. I also read that May spent some 8 years in prisons. Once he pretended to be a police officer and visited handicraftsmen pretending that he is investigating the case of counterfeit money which he took from them for further investigation. When police caught him in the town Děčín (Tetschen in German), he started to fabulate that he is a descendant from German immigrants from Martinique, describing conditions there in a such suggestive way that they believed him. This is what I meant writing that Hitler excused him. Btw. is there any German writing author who sold more books than Karl May? Thanks to myl and Roger Lustig for evidence concerning the "German as official language" myth! I have a small book printed in London by Ward, Lock & Co. n.d. (sometime after 1869): Charles G. Leland "Hans Breitmann's Barty and other ballads". The book is in germanized American with copious footnotes. The introduction says "The hero, 'Breitmann' is said to have been one Jost, a German trooper, of the Fifteenth Pennsylvania Volunteers Cavalry. The language employed is that broken speech used by German emigrants in the Great Republic. As there are some millions of these foreigners and their children scattered throughout the Thirty-one States (the bakery, grocery, or store for sweets and lager-beeer, i almost every town, being conducted by a German), it cannot be wondered at that already the English language in America has become to some extent Germanized. Thus, all the familiar words in German speech, the questions and answers of every-day life, and the names of common objects, are as well known and recognised among all classes throughout the Union as the coins of Prussia and Austria are current and acceptable tender." Now, I wonder why it was considered that this book would have an interest for a U.K. public. It is hilarious and teaches the interested reader much about linguistic and phonetic features. I wonder whether anyone from France or USA ever heard about him. A lot of movie buffs have at least heard about him — histories of the spaghetti western (or European westerns generally) frequently cite him as a precursor. There's a Winnetou reference in Inglourious Basterds, although it seems to be inspired by the 1960s film versions rather than May's books. There's also an odd and tendentious film about him that's been occasionally screened in the U.S. and is out on DVD there. Besides the Amish, the Hutterite colonies scattered across the northern prairies, for example, in Montana, also speak a German dialect. Funny that anyone would associate a Prussian army with "liberty." But there you go – the 19th Century was just plain weird – a fitting prelude to the 20th. "…any more than they can acquire our complexion?" I'm continually amused by Benjamin Franklin's observations on the skin color of such peoples as the Germans and Swedes. Who was white enough for him? @ Michael Tinkler: Well, after the lost battle of Jena-Auerstedt against Napoleon's army in 1806, von Scharnhorst reformed the Prussian army. He abolished corporal punishment (namely running the gauntlet and flogging) and impressment, and tried to make 'soldier' an honourable profession accepted in society. In all this he was ahead of his time, and in a way, at least in the early 19th century, the Prussian army had a lot to do with what for the time must be called liberty. The Texas hill country was also settled by Germans after the failed 1848 revolution. TheTreüe der Union Monument in Comfort, Texas is "the only monument to the Union on formerly Confederate soil." The names of the deceased on the monument are German. They were massacred while fleeing to Mexico. I remember reading way back when he was still relevant that the linguist Bernard Bloch was descended from these St. Louis Germans, and very aware of that. I think that WWII forced a lot of German immigrants to the US, who had been living as both Germans and Americans, to choose. The vast majority realized that they had become Americans rather than Germans. Gringo: There are union monuments at the Andersonville, Ga., Confederate prison camp cemetery. "And in Europe, the Spaniards, Italians, French, Russians and Swedes, are generally of what we call a swarthy Complexion; as are the Germans also, the Saxons only excepted, who with the English, make the principal Body of White People on the Face of the Earth." My grandparents would be surprised. I have to admit being well impressed with Inglourious Basterds inserting the Karl May reference (even if it was anachronistic by referring to a film from the 60s). In the same scene, Edgar Wallace is also mentioned. Wallace, although not as specific a central European reference as May, has been wildly popular in Germany in both written and film form. I don't know anyone here in the US who's ever heard of him, and my UK friends also stare at me blankly when I mention his name (though that may be a generational thing–I'm 34). I only know him from my German friends watching the old films and reading the stories. – Herman Rempel's Mennonite Low German Dictionary "Kjenn Jie Noch Plautdietsch?" I think we are really overstating the obscurity of Karl May in this thread. Anyone who has read a biography of Adolf Hitler has at least a vague idea who Karl May is, and that group includes a lot of American males. Probably most people who watch the History Channel on a regular basis have heard his name. No one reads him, true, but I'd wager his name recognition is probably higher than that of many more talented German authors. Positroll, thanks for linking the US map of ethnic identifications. Of semantic interest is the use of "American" to mean, I'm guessing, in light of there being an "American Indian" and "other" category, no ethnic identification. It's suggestive, however, that US citizens, who identify as such, appear to be overwhelmingly concentrated in former slave-owning states alongside large concentrations of self-identified African Americans. @vanya I don't think Karl May's obscurity is being overstated, I've certainly watched plenty of History Channel in my life and I don't recall May being mentioned in any of the various Hitler documentaries I've seen. Though this topic does make me wonder if there are any famous authors in the English-speaking world that Germans have never heard of. FWIW, not all German immigrants were on the union side. My ancestors from Germany left in 1847, seeing the war brewing, to Virginia. The family split along North-South lines with the coming of the Civil War. The unionist branch made its way to Northern Ohio, the other stayed in the South. Ironically, a century later, the German part of the family would also be divided. The handful of villages that were our ancestral home were on either side of the boundary between East and West Germany, and the family members there had no contact with each other again until 1989 despite being only a few miles apart. @Janice Byer: Most of those identifying as "American" are people of British ancestry who would never use the term "British" because they perceive it, quite correctly, as a political term. Most of these people's ancestors fought the "British" in the revolution. Postscript: As for those identifying as English, most are in New England (where there's probably more identification with England, and/or contrast with "Irish") and in Mormon country (where I suspect the contrast is with Scandinavian). "the burial of this fascinating and important piece of U.S. history"
I actually think it's hard to *under*estimate the importance of German-ness to this erasure. The '48ers have been written out of the standard accounts of U.S. history because they were radicals – revolutionary socialists unafraid to defend and push forward their beliefs using the same tools as their reactionary opponents, up to and including armed struggle. One example: the nationwide 1877 railroad strike was defended against the corporations' paramilitaries in St. Louis by exactly the same folks who fought for abolition – not to preserve the slaveholding Union – who by then had organized themselves into the network of Lehr und Wehr Verein organizations. The '48ers were the targets of the first Red Scare, that of the 1880s. No wonder they are as little remembered as the Finnish Communists, Italian anarchists, and Chican@ syndicalists targeted in the 1920s and 1940s-50s editions of the same process. I am putting together a music program of Civil War music to be performed in St. Louis, MO later in 2013. I would like to include some German songs from the era, but I am not sure what the German immigrants living in St. Louis at the time would be listening to. I have a book of waltzes, schottishes, polkas, etc., but am not sure if those will work. Is there anyone out there in cyberspace who might have some information about this.